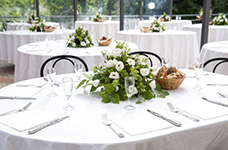 Here at Elite Catering, We are Metro Detroit’s wedding catering professionals! We are fully licensed and insured with over 30 years of experience in the most detail-oriented industry. We know how important a wedding’s food is to guests, and we are reputable for being the best in the business. Rest assured that your guests will be raving about their meals until your next event with us! Our experienced staff is fluent in the art of fine dining and is able to effortlessly communicate this into any sized event. From small, elegant celebrations to grand luxury galas, we strive to make your big day truly unforgettable! Our top-rated wedding catering packages include buffets, plated meals and family-style meals for each and every bride’s budget. You’ll feel as if you’re eating a home-cooked meal with a hundred of your closest guests! We work closely with you to help decide which one of our packages would best fit your wedding, and create a delicious menu from there. Our locally-renowned chefs take your vision and their expertise, thus crafting a meal with endless culinary possibilities. We are also able to provide vegetarian, vegan and gluten-free meals and accommodate many other dietary restrictions. We are LGBT-friendly and enjoy the opportunity to help all couples celebrate their expression of love and commitment by providing excellent service and dining options. Whether you dream of a rustic barn wedding or an extravagant fairytale celebration, we aspire to bring your vision to life. Our professional chefs and staff will seamlessly execute your wedding reception, making it a stress and worry-free day for you! We bring all of the equipment and decorations, as well as set your buffet table for you. Our friendly and attentive wait staff are committed to making sure you and your guests have a memorable event, and will always go the extra mile for you. Sit back and relax as our service staff tends to the buffet table as you and your guests have a delicious meal. When your event is over, don’t worry about tidying up or breaking down equipment. We want to ensure that you have time to enjoy your event instead of worrying about the cleanup. Staff provided for event set up, food service, cleanup, breakdown. 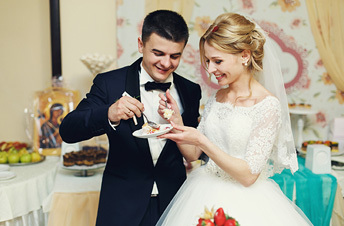 No matter the size or style of your wedding, our experts are ready to help you create a menu that is truly exceptional. Give us a call today!